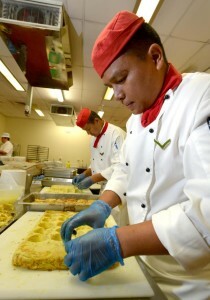 Chefs from the Queen’s Own Gurkha Logistic Regiment have been praised for their support to a Gala dinner to launch World Curry Festival 2016 in Bradford. Thulo shyabas to LCpl Ram Pun and LCpl Mukesh Rai who both played such a key role in helping Grand Master Chef Hemant Oberoi open the event in Bradford Cathedral. The black tie dinner also saw the introduction of the Noon Award, in honour of the late Lord Noon. Known as the Curry King, Lord Noon was instrumental in introducing festival organiser Zulfi Karim to supporters of the event like Mr Oberoi. The inaugural award was presented to Lord Noon’s daughter, Zeenat Noon Harnal. In future years it will be given to an individual who has shown talent in the curry industry. You can read more here.